Come August and Bangalore is all agog with a series of dance festivals. Principal among them are two major ones: Nrityantar's Naman, a two-day dance festival and other is Nrityagram's in memory of Protima Bedi's death anniversary on 18th August. I make it a point to attend both festivals to see what new choreographic works are created by Madhulita Mohapatra of Nrityantar and by Surupa Sen of Nrityagram. On first day 11th August at ADA Rangamandira, from 3pm Madhulita presents the several students studying under her and their parents. She also presents her main dancers who form a core group of hers to showcase their progress and with whom she creates new works. When I arrived at the auditorium it was a pleasant surprise to watch Shankarabharanam pallavi by women in age group of 40 plus learning for past two years. I had seen similar performances in Melbourne where the celebrated Odissi dancer Chandrabhanu, disciple of Guru Debaprasad Das, used to present women of immigrant Indian families in Odissi numbers, whom he had trained and who were also 40 plus. The sheer enthusiasm with which women perform, be it Melbourne or Bangalore was very heartening. Madhulita indeed deserves congratulations for reaching out to women of this age group. One then does not watch their dance critically but sympathetically and also keeping in mind, the spread of Odissi dance among different strata of the society. Shankarabharanam and Arabhi Pallavis are evergreen gems of music and dance compositions by the two legendary artists, one Guru Kelucharan Mohapatra, the dance guru and Bhubaneswar Mishra, the ace violinist, a disciple of Dwaram Venkata Naidu from Andhra. The melodious rendering of the bols tari jham transport the senior rasikas like me to an enjoyable arena of nostalgia. These pallavis are landmarks of Odissi with which it is most important to acquaint the present generation. Madhulita rearranges the movements for the group maintaining the basic format of Kelubabu's choreography. Since it is a group dance, the rearrangements are made with an eye on devising patterns highlighting the several components of original movements. The Parshva Mardala, the Darpani, the Alasa, the Uromandala, the Potala hasta, and patterns be they diagonal, horizontal front line or circle, look attractive. In the swara patterns, performing on heels, change in the mardala playing, and moving joyously in circle, one starts noticing the beauty of the dance. Sometimes I feel some of us should attempt to write deconstructing Kelubabu's choreography, movements and see how the configuration of the entire composition with exquisite music and his mardala playing is achieved! As a choreographer, Madhulita brings to bear upon her work the experience she has having studied under Aruna Mohanty and Guru Gangadhar Pradhan. Paridhi Joshi is one of the principal dancers of Madhulita. Her abhinaya to song "Sajani" brought out poignantly the agony of separation Krishna suffers, looks for Radha everywhere, draws her name on sand, wipes it away often, prepares bed of lotus flowers, calls out her name and embraces her only to realize that she is not there. The sakhi tells Radha to dress up and go unto Krishna. It is somewhat similar to Gita Govinda ashtapadi in which sakhi tells Radha about Krishna's waiting in his bower for her. Gangadhar Pradhan's Rageshri Pallavi performed as a group choreography by nine dancers stood out for various sculpturesque motifs Gangadhar had employed. Veena dharini, Darpani, Alasa, their chowka and tribhanga in order, reminding of Surasundaris on the parapet of Konark temple, came alive in their dancing. Angelina Avnee, the young child prodigy, now seven years old, in her abhinaya solo of Banamali's song "Naa Jaa Jamuna," stole the show. 'How can one so young present the emotions of a mature sakhi of Radha?' posted poet Kedar Mishra on the spot on social media. I am quoting it verbatim, as it expresses succinctly the power of abhinaya by one so young. "Does she understand what she is expressing? Certainly not! She is barely seven and definitely it is not the age to understand the delicate nuances of romance between Krishna and Radha! But how perfectly she expressed it!! Watching it you are stunned! In one particular moment she metaphorically describes the mad excitement of Radha by showing a lotus bloom in the heart; that was most beautiful poetry one saw in dance. 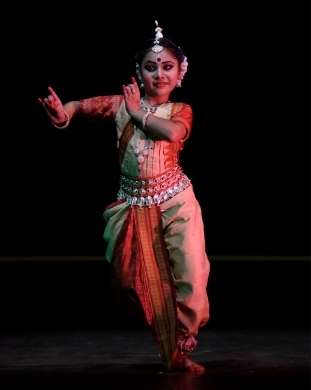 It was an overwhelming experience to see a little dancer, performing such a nuanced abhinaya. She is indeed well tutored by Madhulita." One hope Angelina Avnee blossoms into a fine dancer. Of various other pallavis, Madhulita's own choreography in Malkauns, and Kelubabu's Saveri in which one notices abhinaya as dancers put on various ornaments, karna kundal, earrings, necklace, bangles, was noteworthy. Since these are on recorded music, the sound needs to be controlled. 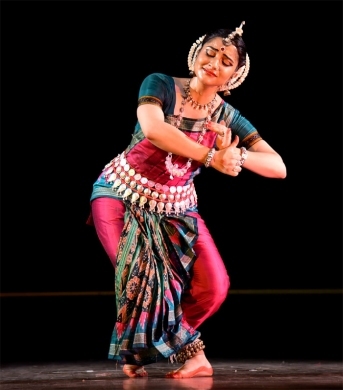 A solo abhinaya by Meghna Das, choreographed by her mother Sahana Das, based on the original choreography by Guru Mayadhar Raut, stood out for vatsalya bava. Yashoda questions Krishna on why did he get up so early, when the dawn had not yet taken place? It was a pleasure to see the song "Uthilo" being revived and was in the category of Vrajaku chor song. Meghna has an attractive personality and performs with complete involvement. "Ahe nila shaila janano" of Muslim poet Salabeg presented by Madhulita's disciple from Mumbai was performed with restraint in sanchari of game of dice and disrobing of Draupadi. Though I have seen and relished this abhinaya piece by Kelubabu several times, I had not noticed how Guruji had suggestively introduced five Pandavas and the Kauravas. I noticed for the first time that Arjuna was introduced by showing his successfully aiming at revolving fish, himself balancing on two plates of a balance and shooting an arrow, then standing with bow and arrow! It had escaped my attention all these years, and noticing it now gave me immense pleasure and I emotionally bowed to Kelubabu for his exquisite touches and economy of presenting characters. Madhulita has choreographed Ishwari item in praise of goddesses Chamundeshwari and Durga, Mahishashura Mardini. She said that she has used the folk dance tradition, the devotees going into trance, using sabdaswarapata with Sanskrit compositions by Nityananda Mishra, music composed by Sukanta Kundu, rhythm by Dhaneshwar Swain, singing by Kshitij and Rupak Parida and text from Devi Mahatmya. It was performed by five principal dancers Paridhi Joshi, Meghna Das, Sahana Maiya, Sonali Mohanty and Vivekini Das.The tantric mood was established with the very first glimpse, two devotees going into trance, Goddess Ishwari surrounded by other two dancers. The unfolding leads us to multiple forms, and attributes of the Goddesses with Sanskrit sabdaswarapata, goddesses with their blood stained visages, wide eyes, holding weapons, combating with demon Mahisha raising his head with horns, three other dancers forming his body, dancing with the demon, one solo dancer holding trishula, attacking the demon and annihilating him- it was a stunning visual. Dressed in red costumes with silver ornaments, they created the mood of devotion, fear, and benediction. Kedar Mishra informed us of various bharanis, chandi bharani et al which are part of rituals from West Odisha of Kalahandi from where Madhulita hails, and also folk dances which are artistically woven by Madhulita. An excellent choreographic work. The finale with Shivam Dhimahi, which Madhulita had presented in previous year as her own choreographic work, based upon text by Nityananda Mishra, to the music by Sukanta Kundu and rhythm by Dhaneswar, was one more number that is rich in poetic and movement content. Performed by Reshmi Divakaran, Swati Prasad, Banashree Mohapatra, Bhargavi G and Ashwashana Biswal, it is a powerful number. Madhulita curates her festival to present a cross section of Odissi styles by leading Odissi exponents. Last year she had presented Aruna Mohanty, Sharmila Biswas and Surupa Sen in solo numbers. This year she presented a former Gotipua dancer Bijan Kumar Palai, a young, up and coming, promising disciple of Aruna Mohanty trained in Guru Gangadhar's style. 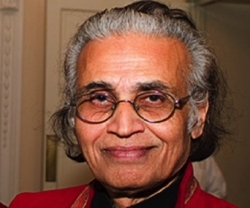 Kedar Mishra's script based on Valmiki's original Sanskrit Ramayana deals with character of Hanuman. Aruna Mohanty's choreography stood out in exposition of Hanuman's arriving flying over ocean, to visit Ravana's Sri Lanka, testing variety of fruits, finally seeing Ashoka vana, where Ravana arrived in his majestic style, and left in a huff when rejected by Sita. Hanuman jumps from the tree, introducing himself as Rama's servant, opening his chest and showing Rama's image, offering Rama's ring, telling Sita that he will carry her on his back from Sri Lanka to Lord Rama. Sita is surprised and questions him with vachikabhinaya: "Katham cha alpa sharirena?" - How would you, when you are so tiny?' Hanuman then takes his Vishwarupa. The way Bijan showing his back to the audience, moves his shoulder muscles and back and rises, he creates an illusion of touching the ceiling of the stage! Aruna's choreography is very impressive. Bijan won rounds of applause for his performance. We see him then assuming his normal form standing on one leg extending his one arm in front, another leg horizontally and creating an illusion of flying away. That was a powerful image; here is a dancer to watch. I have one suggestion for the script writer and the choreographer. The audience knows that after Hanuman takes the great form, Sita bows to him and tells him that she would only go with Lord Rama when he comes to fight with Ravana. Hanuman then bows to her, takes the Choodamani from her, and is caught by Ravana's soldiers who set his tail on fire, with which Hanuman burns Sri Lanka and flies away. After Hanuman takes larger than life form, we see him jumping, setting Sri Lanka on fire and flying away. That looks abrupt. With economical gestures of Sita's bowing to him, offering him Choodamani and blessing him, the choreographer needs to show Hanuman leaving her. Suddenly burning Sri Lanka makes it look not a continuous narrative. Saswati Garai, a disciple of Sharmila Biswas, has drawn attention of connoisseurs for her growth as a dancer with her excellent solo performances. Her Maya Manav, choreographed by Sharmila Biswas stood out for her slow exposition of the story of Maricha taking form of golden deer, whom Lord Rama chases as Sita begs of him to bring the golden deer unto her. The transformation into golden deer by demon, his jumps, hiding behind trees, re-emerging, creating illusions, Rama chasing him, finally shooting an arrow, Maricha crying 'Ha Lakshmana, Ha Sita' and in the end Saswati showing hasta of deer and for demon with urnanabha hasta was an arresting sequence. The enactment was of a high order. Kedar Mishra explained to me that the interpretation by choreographer Sharmila Biswas is to suggest that though human beings have lot of wealth, they lust for more and more. And interpreting Rama fully knowing that the deer was an illusion and still he was running after it shows that human beings run after illusion of getting more and more. With such interpretation Sharmila Biswas has succeeded in making this piece contemporary. That is an interesting observation. However, if it is lost on discerning audience, it still as a performance holds one, as Sharmila explores narrative of Vichitra Ramayana tradition with excellent singing of Shashimani Devi, who does not sing for classical dancers. Sharmila's explorations in terms of music, of talas of mardala playing in other regions of Odisha like Sambalpur etc., are praiseworthy. There are also various rituals which Sharmila has used artistically in her productions. I understand that Sharmila often speaks of it in her choreographer's notes. She told me that 20 years ago she had got a cassette of Shashimani Devi's singing of Vichitra Ramayana and had made up her mind to use it artistically. The finale was by Sujata Mohapatra. She has acquired a stature as a solo dancer, performing Kelubabu's choreographies that linger long in memory. She feels that if she can do justice to her Guru's choreography and creations, her purpose of dancing is fulfilled. There are no two opinions about her excellence. I do not think that she needs to succumb to choreographing new works, though of late she has attempted to choreograph group work. However, her high point is her solo presentations of Guru Kelucharan Mohapatra's gems. I am enjoying those classics. Sujata chose to present Stuti in praise of Durga. It stood out for Guruji's imaginative choreography of evoking the goddess and iconographic images. The multiple arms wielding various weapons, the divine beauty of the goddess and vanquishing demon Mahishasura and her being a Shakti, all powerful images were arresting. There is an aura when one watches her performances. Not all disciples of Kelubabu are bestowed with this quality. This is special about Sujata. In "Vraj ku Chor asuchi" song, though one has seen it many times, every time I watch, I enjoy pranks of Krishna and Yashoda's chiding him. I have often seen too much of lokadharmi abhinaya when Krishna steals butter, eats earth and Yashoda beats him up. The restraint Sujata displays is more enjoyable than exaggerated abhinaya of child Krishna. The ploy of asking audience not to clap when Yashoda leaves Krishna asleep in the cradle has lot of popular appeal. Similar expression I have seen in Irayimman Thampi's lullaby in Mohiniattam. In both lullabies this theatrical expression works. Moksha in Bhairavi raga, choreographed by Kelubabu ending with 'Narayani Namostute' brings happy memories of listening to the sound of mardala, as in this case the recorded music has Guruji's voice speaking ukutas, mnemonic syllables while playing mardala. The finale with Om brings the feeling of Shanta rasa. 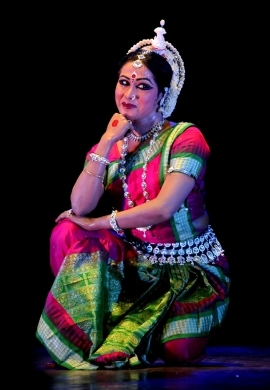 For younger generation of Odissi dancers, Sujata remains a role model. Kelubabu's creations and dancing by Sujata explains why classical arts have eternal appeal. Madhulita, all her colleagues and assistants, the parents who support her, and the large circle of admirers Madhulita has won over past more than ten years, is a tribute to her dedication and sincere efforts. It also speaks for the catholicity of Kannadigas for accepting Odissi as a classical form along with other forms like Kathak and Mohiniattam. Next year will be the tenth edition of Naman festival and Madhulita plans to have group choreographic works of leading Odissi exponents and a seminar in the morning. I look forward to attending it as would others in Bangalore.